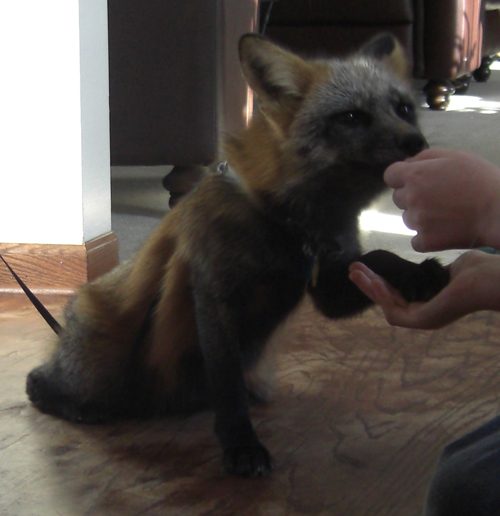 Gizmo the fox, getting a treat for shaking my hand. People are under the mistaken impression that most animals can't be trained. The claim is often that they're not smart enough (or are too smart) or that they're too wild. Well, I've worked with everything from dogs to foxes to cats to chinchillas to rats, and the more animals I deal with, the more I get the impression that you can train anything with a brain stem. Even my cornsnakes have shown that they're capable of learning and adapting (though not to the same impressive degree that mammals and birds can). Although the individual techniques vary from species to species, there are a few rules of thumb that apply across the board. I cannot stress enough the importance of keeping a fun, upbeat attitude while training. This is important for any animal, but more so for a pet fox or other exotic pet. Almost all dogs have an innate desire to please their humans, and will tolerate unpleasantness to make them happy. Cats, pet foxes, and other animals, however, have no inborn desire to please you; they live to please themselves. While this "selfish" attitude is important for survival in the wild, it can be a real challenge to training. An unhappy or bored fox is unlikely to learn anything, so it's up to you to keep every training session fun and upbeat, with lots of treats and praise to hold your pet's interest. Avoid scolding your pet during training sessions, and never hit or otherwise cause pain. Doing so will only teach them to dread and fear training sessions, or worse, to dread and fear you. I even recommend you don't use your typical "scolding" word during training. If your pet gets a harsh "BAD!" or "NO!" when he's being naughty, use a different tone and phrase to correct an error during training. When Gizmo goes to get in the trash, I growl "No!" in a harsh, angry tone. When I tell him to lay down and he tries to shake, I say "Try again" in a low, calm voice. The goal is to convey "That's not what I'm looking for," not "You're in trouble!" How the training session ends has the biggest impact on an animal's memory, so be sure to finish on a high note to keep him eager for the next time. The easiest way to do this is to always end with a success. If your cat or pet fox just isn't getting the new concept you're trying to teach, and you want to stop, have him do a simple trick he already knows and reward him before ending the training session. This goes both for you and your pet. If you're in a rotten mood, your voice will be harsher, your frustration threshold lower, and your patience limited. Your pet will pick up on these signals, and may read them as a correction even if he's displaying the behavior you want. If you're giving him a treat but you smell mad, these mixed messages will confuse him and can even set his training back. It's better to skip a day of training than to try and hide a bad mood. On the other hand, trying to teach an agitated animal is often an exercise in futility. Right after a bath or a trip to the vet is a bad time for a training session. A cat or pet fox that is all wound up, even if it's happy, can also be difficult to teach--if he's squirrely and hyper, it's a better idea to use up some of that energy by playing with him and save the training for later. As I've said before, bored animals don't make good learners (the same applies to people!). Unfortunately, your typical cat, fox, dog, chinchilla, etc., has an attention span comparable to that of most toddlers. To hold their interest, keep training sessions short and fun. Five three-minute-long sessions are better than one fifteen-minute-long one, and it's always best to call it quits while your pet is still eager for more--Don't wait for them to get bored! Consistency has a huge impact on how quickly your pet will learn; the fewer mixed messages you send, the better. If you're teaching your pet fox to sit up on her hind legs, don't say "sit pretty" one day and "beg" the next. If the sofa is off-limits, don't let your dog sleep there one day, then scold him the next. If you use hand signals along with verbal commands (which I highly recommend), keep the hand signals the same from one day to the next. Even being consistent in your choice of training area can be helpful. If you train in one particular place all the time, when your pet sees that he's being taken there, he'll often go right into a learning frame of mind. Especially after being met with a little bit of success, novice trainers often fall into the trap of rushing ahead and trying to teach too much too quickly. Resist the urge to rush, and you'll save both yourself and your animal a lot of frustration. If you've moved ahead, and your pet just isn't having any success, there is no shame in going back to a previous step. When using food rewards, use small tidbits that your pet can crunch down quickly. If you use large or chewy treats, your pet will fill up quickly and lose interest in training faster. Also, a treat that takes too long to eat will interrupt the flow of the training session. You want the rewards to be good--good enough to motivate your pet, but not so good that it'll chew through your hand to get to them. This can be a surprisingly difficult balance to strike. Most dogs have a natural inhibition towards biting, but foxes and other exotic pets generally lack this. If the treat is good enough, they'll often have no problem biting to see if they can make you drop it. Two brands I've found work well for this are Pounce and Temptation brand cat treats. They're small, tasty, and they come in such a wide variety of flavors that it's easy to keep the treats novel and interesting for your pet. I've had my cat for ten years. He's learned to do some odd things. He can stand on his hind paws and walk a couple steps to get at food, and lean on counters, too. You realize that the title says "8", but you actually have 9 points on this list, right? Just consider #9 to be a bonus tip, then! Lovely article! I train my cats (Siamese and Orientals) to retrieve, to jump up on command, to focus on me and to come to call. Lots of people think this is impossible (you can't train cats!) but actually, it's just an extension of our relationship. And sometimes, they train us! hey there , love your site, well done!! i have recently rescued an abandoned red fox bout 6 weeks old, we are getting on great, and i'm planning on keeping him, i have plenty of space and will be building all the necessities, after doing all the research i am looking for some advise on how to litter/toilet train him. Why not just use the "contact info" section to contact her like everyone else, instead of just assuming she'll see the comment? That, and Rags generally doesn't approve of people taking kits from the wild. If you don't get them at 3 weeks or younger, the developmental stage for imprinting on humans passes, and they don't make good pets once they mature. You really should have taken it to a wildlife rehabber. I just got a pet fox and have been trying to teach her new tricks. Knowing these tips will definitely help!